BEIJING - Recent attempts to blame China for a number of international cyber attacks are groundless and aimed at turning international public opinion against the country, analysts said on Tuesday. 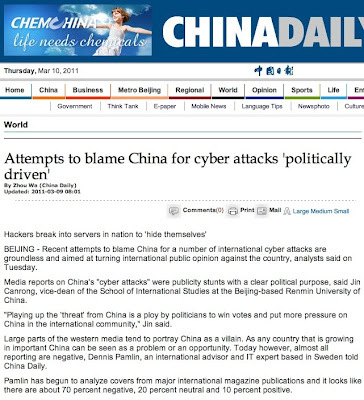 Media reports on China's "cyber attacks" were publicity stunts with a clear political purpose, said Jin Canrong, vice-dean of the School of International Studies at the Beijing-based Renmin University of China. "Playing up the 'threat' from China is a ploy by politicians to win votes and put more pressure on China in the international community," Jin said. Large parts of the western media tend to portray China as a villain. As any country that is growing in important China can be seen as a problem or an opportunity. Today however, almost all reporting are negative, Dennis Pamlin, an international advisor and IT expert based in Sweden told China Daily. Pamlin has begun to analyze covers from major international magazine publications and it looks like there are about 70 percent negative, 20 percent neutral and 10 percent positive. "This is a serious problem," said Pamlin, "it is important to have a discussion about how media is dealing with the combination of new areas such and China's growing importance and issues like IT and renewable energy, where China is playing an important and often very positive role." The French Finance Ministry suffered from a cyber attack in December targeting information related to its presidency of the G20, officials said on Monday. A report on the website of Paris Match magazine claimed that some of the information had been redirected toward "Chinese websites", according to a Reuters report. Yonhap News Agency, citing a South Korean opposition lawmaker, on Monday claimed that Chinese hackers broke into a computer network of the South Korean Defense Ministry last year and got secret documents on a plan to buy spy drones from the United States. David Fouquet, director of Brussels-based Asia-Europe Project Information Service said that such allegations should be treated very carefully and with some skepticism. "There are accusations of this type virtually every week, which are never completely verified there is considerable confusion, misinformation even manipulation in this sector," Fouquet added. "China is likely to once again be made a scapegoat for the hacking attacks," said Cui Baojiang, an expert on information security with Beijing University of Posts and Telecommunications. "Hackers usually connect to overseas servers several times to hide their attacks. China's cyber security technology is so weak that international hackers usually use servers based in China to hide themselves and wage attacks," Cui said. "Many groups are interested in getting hold of information and can use innocent peoples' computers to do this," said Dennis Pamlin. Server protection technology is underdeveloped in China, so it is much easier for international hackers to break into servers based in China, Cui said. 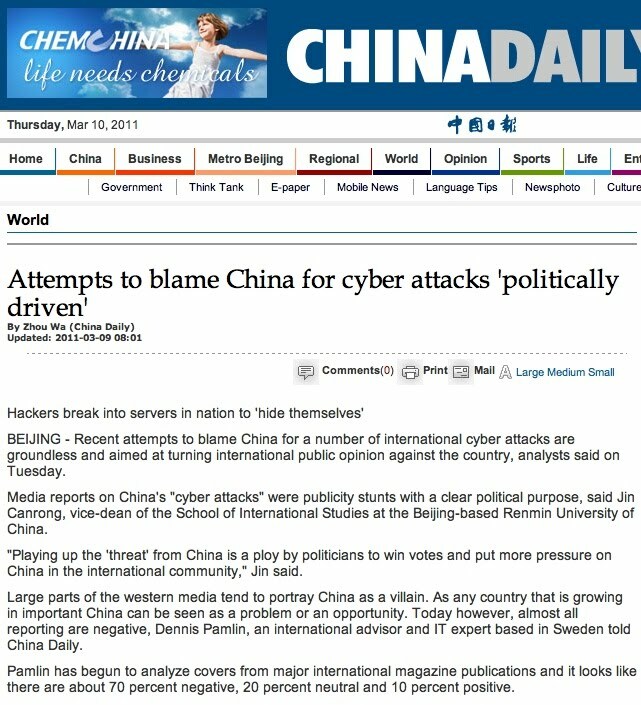 "Internet users in China fail to pay enough attention to cyber security," added Cui. "The amount of Chinese Internet users as well as computers (servers) is so large, which provides more chances for international hackers." Fouquet said that the international community should cooperate to address cyber security in the same way that it deals with issues such as arms control or disarmament, before it gets out of control. At the January summit between Chinese President Hu Jintao and his US counterpart Barack Obama in Washington, both sides agreed to examine the problem, while Russia is also taking steps on this issue, he added.